[Snap] Does snap have unmetered times at night? I thought I read it somewhere but now I can't find. Forums › 2degrees › [Snap] Does snap have unmetered times at night? I thought I read it somewhere but now I can't find. don't think Snap zero-rates akamai. its a bit give a take. snap seem to not charge if its inside of their network. no telling if your pulling from a akamai server outside of their network though. Some have reported Snap -> Snap customers is unmetered, But im sure ive used some when someone pulled data from my web server. I stopped monitoring internal web usage on the network/per PC since we never approached our 200gb+ limit. eXDee: Some have reported Snap -> Snap customers is unmetered, But im sure ive used some when someone pulled data from my web server. maybe its only within the same BRAS? would be interesting to know none the less. long as you only expect nighttimes to be unmetered, since thats clearly stated, anything else is a bonus! cjmchch: Haven't updated a single game yet. wow cjmchch, how big is yah fileserver? Or is that a whole lotta netflix/streaming? 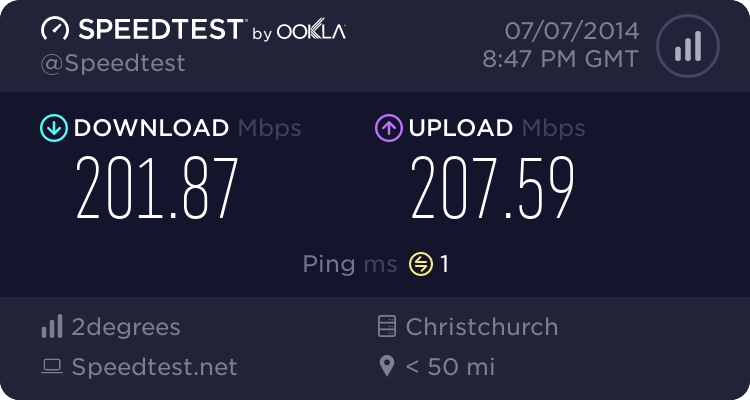 I don't netflix, and very little streaming of Sky - traffic is split probably 50/50 with a total of 5TB being backed up to Oz in process. I'll fill a couple 64Gb CF cards full of photos and video easily in a day which I then backup off shore, so unlimited is a perfect fit for me. Size of my server - not quite a server but my desktop tops out at 12Tb currently. Wow crazy stuff, guessing you're something along the lines of a photographer? Distorter: Wow crazy stuff, guessing you're something along the lines of a photographer?